BRADLEY "B-O" OSCAR: "B-O" played basketball in the national league with Green City, in 1985. But B-O is better known as a Reggae singer, playing with the Sub-Urban Band which recently produced a CD. Recently, Bradley entered the Calypso arena under the stage name, "B-O Bradley"; he is a current member of the Stardom Calypso Tent. CHESTER LETANG: Chester first played basketball in the national league as a founder member of X-Men, around 1994; currently, he plays with Ole Skool. Chester, however, is also well-known on Dominica's music & entertainment landscape. Starting off as a drummer with Swingin' Stars, he later took the mic and came downstage as the lead vocalist for the Orchestra; he was originally referred to as the Soca Man of Dominica. Shortly afterwards Chester entered the national calypso arena using the stage name 'Daddy Chess', made an immediate impact, and in 2001 he was crowned Calypso Monarch of Dominica. This high-energy performer has also captured several other titles: Stardom Monarch of the Tent (2001, 2008, 2017); Road March Monarch (2008), and Soca Monarch (2008, 2009, 2011). He also represented Dominica in a Soca Monarch competition in Trinidad in 2010. Many players and readers may have sung some of Daddy Chess' biggest hits, including 'Your Destiny Depends on You' and 'Forward We Go'. In 2004 he produced 'Welcome to De Fet' - a compilation CD of his songs, and in 2015 Chess produced a 'collab' music video, 'Hotter Than Hot' with Peter Ram; this can be viewed on YouTube. Daddy Chess has also delighted audiences extensively overseas, including several Caribbean islands, China, Dubai, London and USA. CLEM "SWEETNESS" SEVERIN: Clem Severin was well known for his hook-shots from the corner of the basketball court. And he had his own unique style of positioning himself to take a long shot (3-pointers were not yet recognized) while he played basketball in the 1970s with City Lights, then Zodiacs. Clem also coached Roseau Concords and officiated in the national league. Clem, however, was also the 'man under the spotlight' as lead vocalist with Swingin' Stars in the 70s. Basketball players from that period and others may clearly remember Clem performing Sparrow's Troubadours' Calypso, 'Sweetest Black Man' which earned him one of his two basketball nicknames, "Sweetness". CLINT HENDERSON: Clint prides himself as having been the youngest player on Sharpers Division III basketball team in the late 1980s. A few seasons later, he was part of Glassgovians (Off-Season) which subsequently became the original X-Men, of which he was a founder member. Clint was subsequently recruited onto Flames Intermediate, and then mid-season onto the legendary Cardinals. Henderson was also a member of a representative Under-19 team from Dominica that participated in a tournament in Antigua, together with teams from Antigua, St. Kitts and the USA. His on-court position was Point Guard/Small Forward. Clint was first employed as a Sports Teacher at St Mary's Primary and ran a Saturday basketball programme for students from SMP and Convent Preparatory School. Away from the basketball courts and the numbered jerseys, multi-talented Clint is well known in Arts & Entertainment circles where he goes by the stage name, "Clint H". 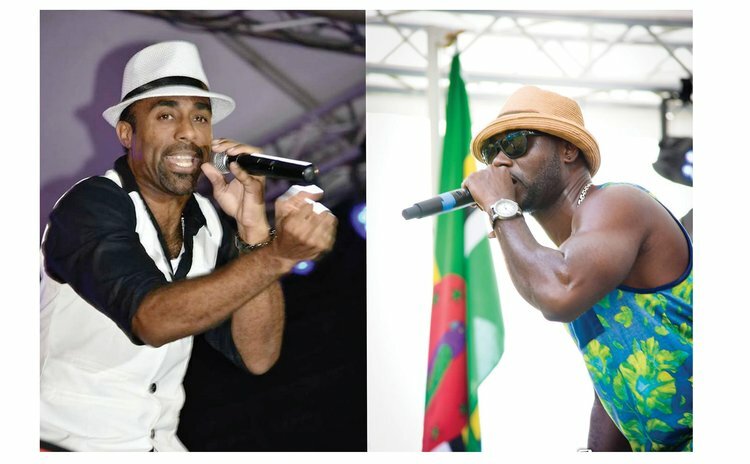 As a vocalist, Clint was a founder member of Efex - one of the 1990s local bands that pushed Dominica's Bouyon music. He was part of Efex when they performed in Madagascar in 1997. Clint H also featured in several live performances with Partners in Kryme (a.k.a. P-I-K) and is a former member of the WCK Band. He has also recorded several Bouyon songs with PIK, WCK and Triple Kay. Currently, Henderson serves as a music producer. CUTHBERT ELWIN: Cuthbert (deceased) played basketball with St. Mary's Academy (SMA) senior team, and later went on to coach the SMA team in the Sports Division Under-19 Secondary Schools Basketball League. Off the court, Cuthbert sang with RiverSong Choir. DEXTER FRANCIS: Dexter played basketball as a Point-guard with Flames and Cardinals in the national league. He is also a member of the RiverSong Choir.